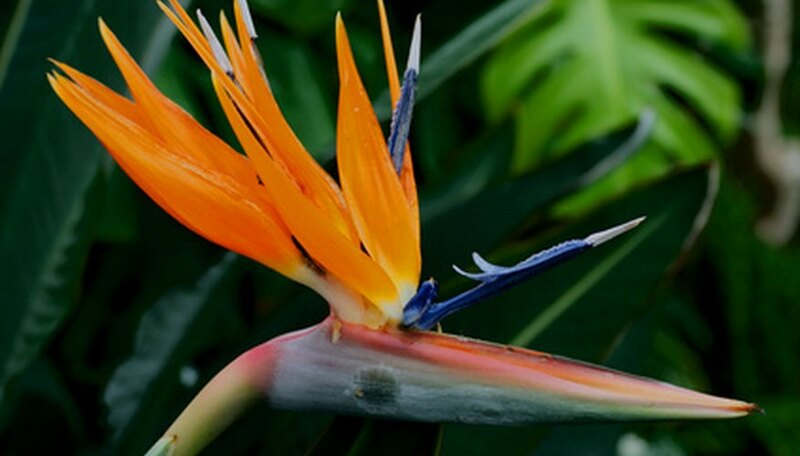 The scientific name for the bird of paradise plant is Strelitzia reginae, and it is also commonly called the crane flower. The bird of paradise flower is unique in that it looks like a bird in flight. The bird of paradise plant can grow up to 5 feet tall. If you are considering adding this plant to your garden design, you will want to know how to properly care for it. Plant your bird of paradise plant in soil that drains well. Soil that does not drain will cause the roots of this plant to rot. Measure the diameter of the root ball and place your root ball two to three times that deep into the soil. Water your bird of paradise plant regularly in the spring and summer months, but only occasionally in the fall and winter. If you experience a lot of rainfall, you do not need to water your plants very much. Spread blood meal around your bird of paradise plant once every three months during the spring and summer months. This will keep the area fertilized. Add a layer of mulch to the ground around the bird of paradise plant. Make sure the mulch is 2 inches away from the stem of the plant so it is not rubbing up against the stem. Make sure your bird of paradise plant is getting plenty of sunlight. The bird of paradise is considered a tropical plant and needs a good amount of light to thrive. If you spot an aphid or a caterpillar on your bird of paradise, pick it off or wash it away with a hose. If you are growing your bird of paradise plant from seed, be aware that it won't bloom for about three to five years afterward.